On August 21, the first total solar eclipse to make an appearance over the continental United States since 1979 will pass within 150 miles of Memphis. The last time a total solar eclipse spanned the contiguous U.S. (as this one does) was 1918, nearly a century ago, and the first total solar eclipse visible anywhere in the CONUS in 38 years. Despite the area of totality missing Memphis by a short drive, most of North America, including the Memphis metro, will experience a partial eclipse. 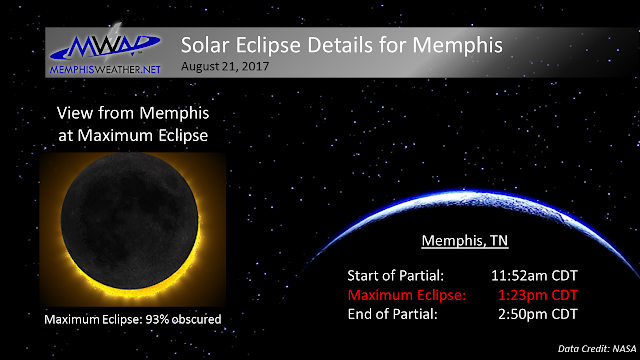 In the case of Memphis, the sun's obscuration will be 93%, so nearly total! From NASA's total eclipse page, eclipses occur when the sun, moon, and Earth periodically align. Solar eclipses happen when the moon moves between Earth and the sun. When the moon eclipses the sun, it produces two types of shadows on Earth. The umbral shadow is the relatively small area on Earth where an observer would see a total eclipse. The penumbral shadow is the much larger area where an observer will see a partial eclipse. Here, the sun is not completely covered by the moon. During a total solar eclipse, there is as noticeable drop in light level (like twilight) and, subsequently, air temperature. The brightest stars and the planets become visible. Animals act like it is nighttime with birds and squirrels nesting and crickets chirping. In other words, there is nothing quite like it during the middle of the day! Solar eclipse of July 22, 2009 taken by Lutfar Rahman Nirjhar from Bangladesh. The Memphis metro will not be in the path of totality of this year's solar eclipse, but will be well within the area of a partial eclipse. In fact, for the Memphis area specifically, the sun achieves 93% obscuration, or very near totality. The nearest areas which will have a total eclipse are about 150 miles northeast of Memphis as shown in the map below. The path of the total eclipse is shown above in the map generated by NASA. Times of maximum eclipse at various points are provided as well as the duration of the total eclipse (which is higher the closer to the center of the shadow you are). 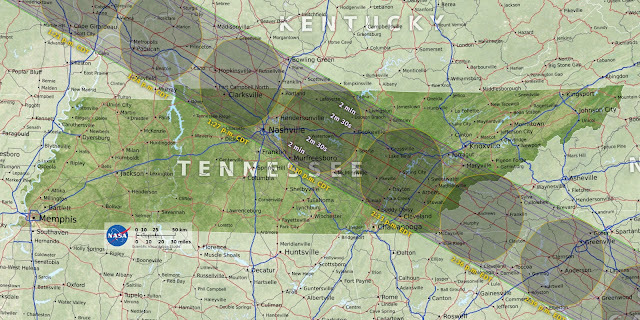 If you are considering a trip to see the total eclipse, the closest large cities within the path of totality are Nashville and Paducah, although anywhere along the path shown in the map above will do! You can look up these same details for any location in the United States from this site. Of course the other major consideration on an eclipse day is cloud cover. If it is overcast, it won't matter whether an eclipse is occurring because you won't be able to see it! NOAA's National Centers for Environmental Information (NCEI, formerly NCDC) has done research on local climate data (cloud cover specifically) to determine the "viewability" of many locations within the eclipse area. 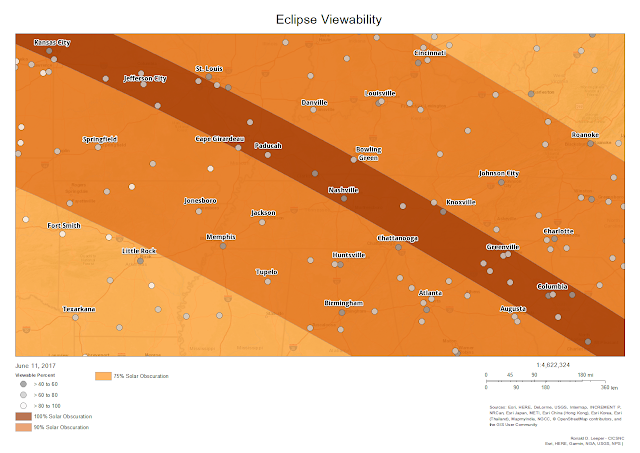 Shown below is a map of eclipse viewability in the region of interest for Memphians. Each dot is shaded according to how likely that location is to produce good viewing conditions based on historical record (of course anything could happen on August 21, 2017!). Here in Memphis, the climatological record says there is a 51% chance that the eclipse is viewable, with cloud cover being scattered or less 61.6% of the time historically. In Nashville, the "viewable ratio" is just 44%. The closest locations with the best potential for good viewing conditions within the path of totality are Paducah and Cape Girardeau, MO (both 77% "viewable"). 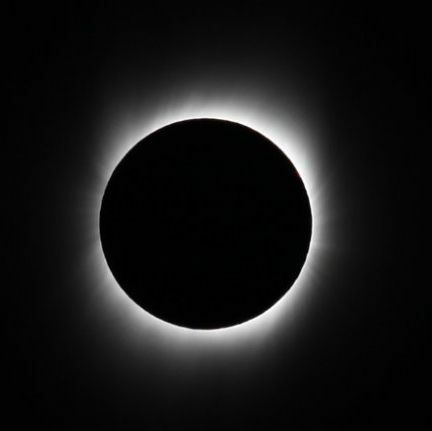 Looking directly at the sun is unsafe except during the totality phase of an eclipse, when the moon entirely blocks the sun’s bright face, which will happen only within the narrow path of totality as described above. That will NOT occur in the Memphis area, as we'll experience only a partial eclipse (even though only 7% of the solar disk will be visible locally, it's enough to burn your retinas if you look directly at it). 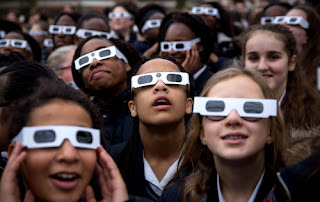 The only safe way to directly view a partial eclipse sun is through special solar filters, such as “eclipse glasses” or hand-held solar viewers. Homemade filters or ordinary sunglasses, even very dark ones, are not safe for looking at the sun. 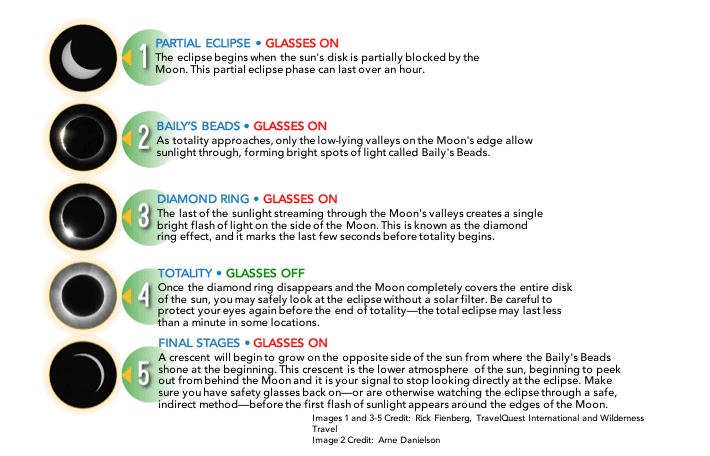 Four manufacturers have certified that their eclipse glasses and handheld solar viewers meet the international standard for such products. One of those manufactures eclipse and 3-D glasses for worldwide use right here in the Memphis area - American Paper Optics of Bartlett! All glasses or solar filters should be inspected before use. If scratched or damaged, discard them. 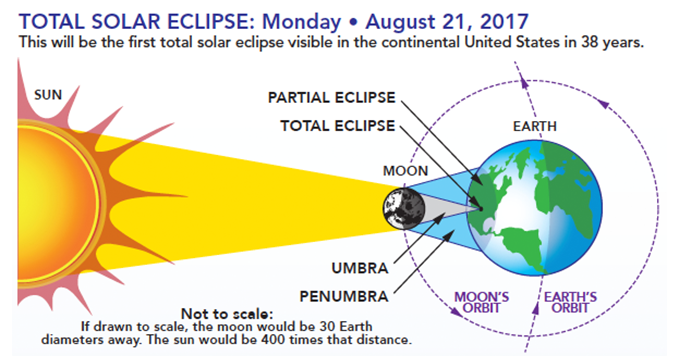 To view the eclipse, stand still and cover your eyes with your eclipse glasses or solar viewer before looking up at the bright sun. After glancing at the sun, turn away and remove your filter — do not remove it while looking at the sun. If you decide to travel to a location that experiences totality, you can safely remove your solar filter or glasses only when the moon completely covers the sun’s bright face and it suddenly gets quite dark. As soon as the bright sun begins to reappear, replace your solar viewer to glance at the remaining partial phases (see above tips). 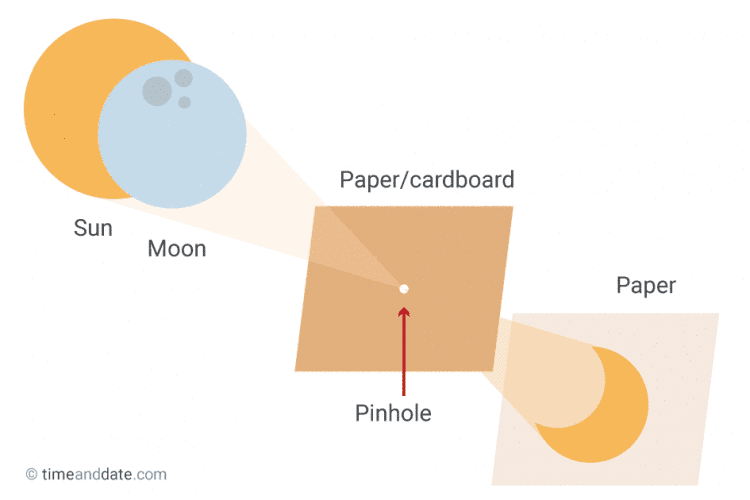 An alternative method for safe viewing of the partially eclipsed sun is pinhole projection. You may remember doing this for previous partial eclipses in the past. Here are instructions to make a very simple projector out of cardboard. Viewing an eclipse can be done with solar glasses or with a "pinhole camera," which is diagrammed above. Now we need to all cross our fingers for a sunny day on August 21! (By the way, if the weather doesn't cooperate, there's a rain date. On, April 8, 2024, we will see another near-total eclipse in Memphis (actually 97.5% obscuration instead of 93%) at 1:56pm. So if the clouds abound, hang onto those glasses for six years! Good info here. I've been watching this closely since last October, and for all the hype surrounding Hopkinsville KY (some calling it Eclipseville), Carbondale Il still looks like the best candidate in our area to catch the shadow. Great info, Erik! I especially appreciate the link to the company that sells approved viewing glasses, and it's great that they're right here in Bartlett! Haven't checked them all out, but the most popular one sells for only $15. Maybe we can pick it up instead of having it shipped, haven't checked that out yet. But thank you again!